FLORENCE, SC (WMBF) – The Florence mail processing and distribution facility now has three more months before it’s scheduled to be completely relocated to Columbia. Political pressure from Congress has caused the United States Postal Service to delay the consolidation of a total of 82 processing facilities from January 15, to April 18, according to Harry Spratlin, district communications coordinator for the Greater South Carolina district. “We’ve still been protesting out in front. 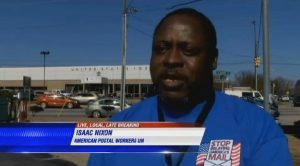 We had a protest back in November,” said Isaac Nixon, president of the American Postal Workers Union Florence Local 2408. “We met with Congressman Rice,” Nixon added. Nixon said he understands letter volume has gone down in recent years, but he sees the consolidation affecting delivery times. Other Florence residents agree. “Someone mailed me a letter and they asked, ‘Did you get it yet?’ I mailed it on Tuesday,” said Pat Gibson-Hye Moore, who lives in Florence. “It was already Thursday, and I hadn’t gotten it,” Moore said. First-class mail did move to a two-day service nationally as of January 15. USPS estimates 44% of first-class mail could take three days to arrive. “You still need good service. You can’t abandon the Pee Dee region just because we have a little bit of down mail,” Nixon said. The consolidation is an effort for the self-supporting government organization to save money. USPS would save $20 billion by 2017, which is necessary after losing first class mail to the internet, Spratlin said. “Having a vast amount of first-class mail, which is our bread and butter, reduced by 53%, it causes us to be put in a position where we cannot do nothing,” he said. Two overnight mail departments in the Florence Post Office were scheduled to run entirely out of Columbia by now. Out of the 150 people who were in those departments when the consolidation began in 2013, about 66 are left in Florence, Spratlin said. As union workers, they are being given the chance to bid for jobs within the company. “We’re being very liberal in providing training and giving them preferences in the jobs that are up for bids,” Spratlin said. The Florence Post Office’s other departments along with package delivery and standard mail will not be affected. via Politics delaying consolidation of Florence mail processing plan – WMBFNews.com, Myrtle Beach/Florence SC, Weather. This entry was posted in Downsizing USPS, Postal Reform and Politics and tagged American Postal Workers Union Florence Local 2408, closure, Congressman Rice, consolidation, First Class Mail, Florence, Florence Post Office, Greater South Carolina District, Isaac Nixon, reduced service standards. Bookmark the permalink.